For many years, I would plunge into our summer program in NYC the day after I led our students back from our summer program in China. Having just accompanied our students all over China, deeply immersed in the language and culture, I have always found myself even further elevated by the intense and profound language and cultural learning I witnessed in our NYC program. And the same happened in the summer of 2018. On Sunday, July 8th, upon returning from our Summer Program in China, I handed over our students to their parents at Newark Airport after a flight from Beijing. With the scent of desert sand and wind still fresh in my memories, I conferenced with Lei, our Teaching Director, and Janet, one of our teachers. Both had spent months co-designing our Summer Camp NYC curriculum. The very next day, on Monday, July 9th, together with all of our staff members, we welcomed our 2018 Summer Camp NYC students. References to the characters and stories from this Chinese classic frequently pop up in Chinese people’s daily conversations. Someone unfamiliar with this classic can feel bewildered, just like many Chinese folks are bewildered by cultural references in chats of Americans. Why don’t we give our children the knowledge of this classic so they can become oriented and grounded in their encounters with Chinese people and with the Chinese life? How cool would it be if we could take advantage of the generous amount of time we have with our campers in the summer and deliver this classic to them? After all, each of our 2-week sessions gives campers 60 hours with us, which is equivalent to the number of hours students from our regular year program cumulate over an entire school year. Beyond these, we also wanted to use interesting stories to entice our students to listen to and speak a lot of Chinese! So, in addition to the themed activities, like all years, our campers also did cooking projects, went on field trips, and played ping pong at SPIN (a highly professional and fun ping pong club). This essay is not about how the Journey to the West curriculum was designed, structured or carried out. Instead, it is intended to help you take a peek into the minds of our CCBG teachers and educators — what we view that counts as true moments of growth within a summer program of Chinese language and culture. Journey to the West — Children’s illustrated storybooks. Towards the end of each session, most campers knew the Journey to the West stories better than most Chinese adults and children I have encountered. They watched, listened to, drew, and acted the stories each and every single day during their two weeks with us (several campers even spent four weeks with us). Day by day, they gained a bit more in fluency, grew a bit more appreciation, and became a bit more interested. A parent happily shared with us about his daughter, “At our home, we have had the Journey to the West storybooks for a long time. My wife wanted to read her the stories, but she didn’t want to listen. Yesterday, she found those books and asked my wife to read to her.” This camper, Alisa, commuted daily all the way from Long Island with her dad to our camp. It seemed that her efforts were getting some meaningful returns. After a session with us, another camper, Allie, went with her parents to Taiwan to visit family. After they came back, Allie’s mom paid us a visit and shared with us not only treats from Taiwan but also follow ups about Alisa. She said in their previous visits to Taiwan, Allie would rather still speak English and was not interested in watching local Chinese programs on TV. But this time, Allie spoke Chinese and watched TV in Chinese. During our camp, Allie took up playing ping pong, and in Taiwan, the morning before they flew back to NYC, she and her dad went to play ping pong! These quick exchanges with our parents were evidence of learning we were eager to see. The best learning molds a learner’s arousal, attention, interest and motivation patterns. Many of the stories in Journey to the West involve monsters in disguise as various characters trying to eat Tang Seng (the monk), such as Red Boy, the son of Princess Iron Fan. Therefore, our campers became familiarized with words like Yaoguai (妖怪), meaning monsters, and bian (变), meaning transform. The whole group burst into laughter. Lewis got the idea—in the stories, the best looking, most attractive and appealing people and objects were often yaoguai in disguise in an attempt to lure their victims. In this classic, beauty and deception are intertwined. I looked at my group — low and behold, he was in fact the only boy that day! The Kingdom of Women referenced to one of the stories the campers were working on. It tells of when Tang Seng and his disciples have reached a kingdom where all of its citizens were women and there was not a single man. On the Roosevelt Island Tramway crossing the East River. In the past, students would either answer “East River” (which gave me the chance to teach them its Chinese name: 东河) or they would shake their heads (which gave me a chance to teach them a little bit of NYC geography). With this in mind, I thought I was fully prepared for a teaching moment. Jake and Natalia’s camp group were working on the story of how Tang Seng (the fictional name of the great Tang dynasty monk, Xuan Zang) found and gathered his third disciple—Sandy. Jake played the role of Sandy in their group’s performance, which depicts the story of Sandy, who originally was a river monster living under the Liusha River. Natalia played the role of the White Horse that the river monster ate up. This was why Liusha River was on their mind a lot those days. Children are spontaneously and endlessly creative. Our job as adults is to place them in the soil that allows their creativity to take root and grow. One of our student ordering at Pinkberry with the English Permission Card in hand. Towards the end of the first week of Summer Camp, I made a trip to Middlebury College in Vermont to offer workshops to the students of their Masters program who are Chinese teachers or are in training to become one. The workshops were a thorough enjoyment because the teachers and I converged on the most important topics of the value of psychological science in teaching languages. However, what truly took my heart was the summer Chinese immersion program setup at Middlebury College: undergraduate students from all over the U.S. live and study on their campus for eight weeks, and they all sign a pledge to only use Chinese on campus. Thus, everywhere I went on campus, Chinese was spoken—everyday chats in the cafeteria and lobbies, announcements on the speakers, chants and cheers during a volleyball game. I went to their Saturday night party held that weekend to verify that they actually managed to chat in Chinese while dancing. I took videos of some of these moments, simply because I wanted to remember them for myself. But upon returning to our NYC camp the next week, an idea came to me: I would show these to our campers. With CCBG, we have an identical all-Chinese policy as that of Middlebury College. We call it the “All-Chinese User Policy,” and this rule applies to all of our programs throughout the year. Typically, our students fall into a few groups in their performance under this policy. Most of our students each year manage to score perfectly by not speaking English and actively speaking Chinese within our space. So were most campers this year. I thought, if these campers see the efforts of these older kids from Middlebury College, wouldn’t they receive a clear and loud message of affirmation? A small group of students show good control of not speaking English, but don’t actively push themselves to speak a lot of Chinese. So were a few campers this year. If they see the Middlebury videos, would they feel inspired to push themselves more to speak Chinese? An even smaller group of students sometimes have a hard time controlling themselves to not speak English. So were a couple of campers this year. If they see the Middlebury videos, would they feel compelled to control themselves more and try harder? The time came. Our campers were mesmerized by what they saw the Middlebury students did. After the watching, a brief moment of silence. To me, that was a bold question. Why should I count on little kids wanting to and envisioning their much older selves to spend eight weeks at a campus just to speak Chinese? But one hand raised up. And another, then another. Rather quickly, all hands were up. Campers (some are friends as well as siblings) who had been solely using English with each other chatted in Chinese on the streets, at lunch tables, and while working on projects. At the Pinkberry across the street from our camp, where our teachers sometimes took campers for frozen treats, campers would first ask for the English Permission Card from a teacher before it was their turn to order from the non-Chinese speaking sales clerks at the register. At SPIN, our campers routinely greeted the non-Chinese speaking staff in Chinese. One camper even got to teach some Chinese sentences to the staff members who picked up the balls around the ping pong tables. Two incidents occurred in the span of one hour, which illustrated another kind of growth moments. I explained that, 找到 (zhǎo dào) indicates that the penny was discovered on purpose, while 捡到 (jiǎn dào) indicates that the penny was discovered by accident, which better fits her situation. This person is a middle-aged Caucasian man with glasses, and he started to speak Chinese with us. He complimented the children and we also asked about where and when he learned his Chinese. With a bit of extra time in hand, we got off the train and went to Pinkberry. Campers ordered in English with the English Permission Card. We sat down to eat our frozen treats and chatted in Chinese. Sitting next to us was an African-American man with his girlfriend who is Asian. They looked at our campers from time to time with big smiles on their faces. He spoke in clear and accurate Mandarin. I was amused that he would think I had four children of identical age with such different looks, but I took it as a compliment that he felt I looked motherly to our campers. What amused me even more was the fact that a seemingly random person next to us who didn’t look Chinese could speak Chinese so well. And this encounter happened shortly after the encounter with that Chinese-speaking passenger on the subway train. For teachers such as myself (whose most prized gifts are effective learning moments like these), I felt a sense of destiny at that moment, as if these events were predesigned by some unknown entity for us as mini-sessions of learning. That day, I didn’t point to the person and tell our campers, “Look, his Chinese is so good! Let’s work harder on our Chinese!” In moments like these, learning is taking place simply by your spontaneous involvements with the world. Our oldest camper this year was 13-year old Grace. While assigning a role for her in the play, she was very reluctant at the beginning of the camp. Janet, the lead teacher for Grace’s group, spoke with Grace and was told, “I want the role with the fewest lines.” But Janet was able to convince her to take on the leading role. Grace was nervous, but she practiced hard. Then gradually her nervousness turned into excitement. Within a week or so, her interest started to dampen. We realized that she mastered things really quickly and now she needed more challenge. So, we asked her to support another group of campers and she became absorbed in the design of a Buddhist Scripture Room for the background of that group’s play. She also supported that group as their backstage handler. Upon finishing her tasks on the last day of camp where campers did their performances, Grace ran to me and her mom, looking like she was about to collapse, like a runner who just finished a race. She said, “I’m exhausted!” with a big smile on her face. “Good job!” I told her, and “That’s the idea”, I said to myself. 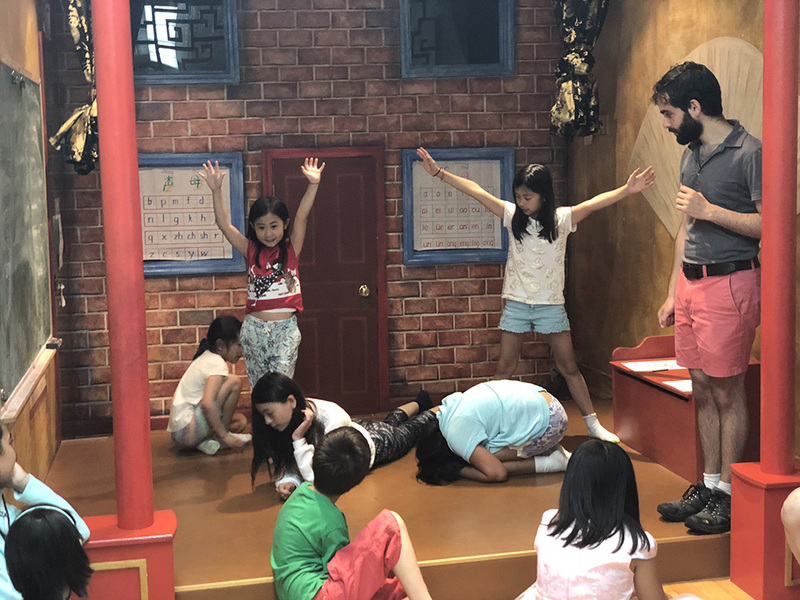 Our theatre teacher, Michael Leinbenluft, taught our campers many acting skills and concepts such as: not breaking one’s character, and pre-performance warm-up games that integrated Journey to the West character names and their iconic postures. Individually, Michael pushed campers to perform effectively. In the story of Thrice Defeat of the White-Bone Demon (三打白骨精), Anna, a gentle and sweet 11-year old girl, volunteered to play four different characters: the devious White-Bone demon and also as her three disguises—family of three with a father, a mother and the daughter. When Anna performed the part of the father, she lowered her voice to sound like an old man, and spoke with the intonation of an old man. Her acting was so on point that as she came onto stage as the White-Bone Demon, moving and speaking in the exact demeanor as the elegant-yet-calculating demon, I got chills. Jake, playing the role of Sandy the monk, held up the character’s necklace made of “bones of people he ate” and did a monologue explaining his transformation from a river monster living in Liusha River into a devout disciple of Tang Seng. Jake’s acting mesmerized me. His group’s lead teacher, Lei, showed me video clips of Jake working on his lines at different points. It was clear that he made step-by-step improvements with the support of his teachers. I am Xuanzang, Buddha’s disciple. I have been ordered by the Tang emperor to come all the way to you, to seek for the real scriptures to bring back to bring my people their salvation. I hope you can do us the greatest favor, and give us the scriptures to bring back to our homeland. Karen seemed determined to tackle the longer version. This passage would be difficult, but given Karen’s age, Chinese ability and determination, reciting it is doable and even beneficial. So, we set forth to make this happen! I spoke with Karen’s mom over the phone about the script. Upon hearing the reasons, she fully supported the idea. Although she herself did not speak Chinese, she got her babysitter on board to help. And for the next few days, each morning I would get an update from Karen and her babysitter about their progress. Karen tackled the passage chunk by chunk. When we departed for SPIN to play ping pong, she would ask me for the script and would recite on the way. The first day when Karen was able to recite the entire passage, we got her to stand in the middle of circle to recite for the entire group. All the campers listened in silence and applauded her when she was done. PART 5: Can A Girl Play The Role Of A Boy? A scene from the famous Peking Opera “The Wandering Dragon Tricks The Phoenix,” featuring Peipei Jiang and Zheng Liu. Of course we explained that the situation in ancient China was quite different from now. We also affirmed that a girl playing the role of a male character was done often in Chinese acting. After this discussion, campers understood and all seemed to be satisfied. However, during the meeting, our teachers started to think—Can this be another learning moment for our campers? The idea of Peking Opera came to mind. Firstly, for a long time, females were not allowed to perform within the Peking Opera, therefore male performers had to play the female roles as well (just like back in the days of Shakespeare theater productions in Europe). But as a small number of females were allowed into the profession, a few were bold enough to take on male roles! Later that weekend, we got connected with a Peking Opera actress, Peipei Jiang. She is a leading performer of Peking Opera, and is known for playing the roles of male characters. We went through video clips of Ms. Jiang’s performances and selected a clip from a performance of a story called Youlongxifeng (游龙戏凤—The Wandering Dragon Tricks the Phoenix). The story tells of a Ming dynasty emperor disguising himself as a commoner and roamed the countryside. At a small inn, he fell in love with its innkeeper—a young maiden. Ms. Jiang played the role of the Ming emperor while Zheng Liu, a male actor, played the role of the beautiful innkeeper. The video clip we had selected features the conversation, in the form of singing, between the two main characters at the beginning stage of a courtship. We first asked our campers whether they knew Chinese people’s favorite traditional-type of play or opera. They shook their heads. We told them it is Peking Opera. Then we asked whether they had encountered Peking Opera. Again, they shook their heads. We then asked whether they would like to watch a bit of Peking Opera. Everyone nodded, with obvious curiosity and eagerness. With a brief introduction of the story, campers watched the clip, laughing throughout at the silly but witty emperor. The emperor was manly and handsome, and the innkeeper was delicate and attractive. The emperor had a beautiful male voice and the innkeeper had an elegant female voice. After watching the clip, we revealed to our campers the casting secret—the role of the innkeeper was played by a man, and a woman played the role of the emperor. In this silence there was thinking and digestion, followed by a sense of inspiration and freedom of exploration. Interestingly, this is the type of experience that is hard for children to be aware of, let alone to articulate. But this is precisely what counts as learning—an important type of learning. Afterwards, we told our campers that Peipei Jiang, the female actress who played the emperor, will be visiting us that Friday to watch their plays. Throughout the week, the work of all the groups moved on very efficiently. We were not sure to what degree this had to do with the Peking Opera inspiration, but we knew that education relies on many learning moments like this. During the four weeks of Summer Camp NYC, every afternoon (except for field trip days), we went to SPIN to practice pin pong with our coach, Taylor. On the morning of Thursday, July 19th, our colleague, Lana, called in to warn us about a steam pipe explosion near SPIN at the Flatiron area of Manhattan, and we should be careful about going there. After calling SPIN and reading some reports online, we decided not to go. Instead, we invited Taylor to train our campers in our space. We do have one ping pong table and a room dedicated for this activity. As Taylor would be in our space anyway, teachers thought of asking her to do something she couldn’t do otherwise if we were at SPIN—to enhance our campers’ understanding of the rules of competitive ping pong games through watching a professional game. With this in mind, Taylor selected two games for our campers to watch. One was of her and a teammate winning the championship for Women’s Double in the 2017 Women’s Championship. The other was of her, as a U.S. National Team member, playing against a Thai player at the Women’s Single during the 2018 World Games. While watching both the videos, Taylor explained the rules of each. Our campers were fascinated by Taylor’s explanations. When we watched the last few serves, all of the campers were in complete silence. Everyone was captivated by the suspense and excitement of the last few rounds because they understood what was at stake—Taylor explained earlier: if she would win the game, the U.S. team would enter the semi-finals, but if she lost, the U.S. team would be taotai (淘汰), eliminated. But then, the moment of truth came as Taylor hit the last ball to her opponent’s side, winning the game! Our campers and staff erupted with cheers, myself included. Our campers with their teachers and ping pong coach Taylor. Among the campers, in a split second, I saw the eyes of a little boy lit up. This little boy felt nervous about various things, such as being on stage, public speaking, and not being in control of a situation. At this moment, I knew what he was shocked by—What? A top player in the nation was nervous? It is normal to be nervous? Even when you’re nervous you can still win? Seeing how this little boy lit up melted my heart. To witness such a moment of growth is any educator’s luck. Michael and our campers at rehearsal. Do you know the main flower that is associated with Buddhism? The lotus flower. Do you know the animal that is associated with Buddha? A white elephant with six tusks! Have you ever in your life looked at Sanskrit letters? Well, I did, and for the first time in my life when our campers asked us to examine some Sanskrit writing samples while they were designing the Scripture Room for the last scene of the play. It is also in the same fashion that the campers got me to learn about the lotus flower and white elephant with six tucks. One such camper, last year, refused to play even a very small role in a play. This year, he volunteered for multiple roles, and for each, delivered an amazing performance. Before the camp, our theatre Michael relayed that the story lines of Journey to the West might be too complicated for our children to memorize, let alone to perform. He suggested a simpler theatre freeze-frame technique called Tableau (derived from the French word which means picture). After hours of debate and discussions, our teachers decided not to take Michael’s suggestion. And by the third day into camp, Michael was pleasantly surprised when he saw that our campers had all grasped their stories very well, not only theirs but also other groups’ stories. They also started to put their movements together on stage. I was the lead teacher of the last scene of the play, where Tang Seng and his disciples had finally arrived in the West and asked Rulaifo (如来佛), the Buddha, for the Buddhist scriptures. But, wait a moment! Why didn’t I ever think about that before Angela pointed out the contrast of the Tang Seng from the story and the real life Tang Monk? This may be a creative choice by the writer to simply end the fiction by hurrying all the characters back to their native land. Besides, the exciting parts were the monsters and demons, and the morals taught along the way. The pinnacle of the story was reaching the destination. Or, this may be an indication of a belief, where the author and his readers saw it as natural for “real teachings” to be in the form of something (in the case of this story: scriptures) that one can get hold of physically and they are yours. Thus, there is no point in depicting the characters to remain in India, to debate, to lecture and continue to learn such teachings and get them into your blood, like the real life Tang Monk did. Could this explain some of the functional behaviors we see today among some people? That someone can just swoop in and grab a technique or theory that took years and many lives to develop? Angela’s comment that summer day helped me see the current world with a new angle. My group of campers performed the last act. The plot was Tang Seng and his disciples have finally reached the West and asked whole-heartedly for Buddha to give them the real scriptures. However, as Tang Seng refused to bribe Buddha’s two assistants, they gave him the fake scriptures. In yet, another attempt to get the real scriptures, upon being asked again for a bribe, Tang Seng handed the assistants his only possession of some value—a golden bowl given to him by the Tang emperor. A bowl symbolizes a monk’s entire livelihood because that is what they use to ask for food to feed themselves. I was the narrator for this act of the play. I stood next to Karen who played the role of Tang Seng. With all sincerity in her eyes, she handed over the golden bowl (which in real life is just a plastic yellow bowl) to Buddha’s assistants. I had great difficulty controlling tears swelling up in my eyes. The Campers’ performances always reminded me of the human condition, in which someone would give up his/her entire livelihood to pursue something higher, bigger and for the good of all people. On this cold day, as we approach the Christmas of 2018 and the beginning of 2019, I wrote this essay on behalf of all of our CCBG teachers and parents involved in our Summer Camp NYC 2018, to commend the sparkles that our campers have brought to our lives this past summer!